Everything changed for the VFA in late-1896 when their strongest clubs broke away to form the Victorian Football League (VFL). The VFL quickly assumed control of football in the colony and took the VFA's place as Victoria's official representative team, consigning the Association to a secondary role. In 1897 the VFA did well to secure a match against the strong Ballarat Football Association (BFA) who had surprised football followers with a 35-point defeat of the VFL in June. Two months later in Ballarat the supposedly weaker VFA were not expected to win, but win they did, posting a hard-fought 3 point victory. The VFA side wore borrowed Port Melbourne uniforms for this match. The VFA side wore borrowed Brunswick uniforms for the game (NOTE - this was not an official representative match). Following the split of late-1896, the VFA had repeatedly challenged the VFL to a representative match to decide the matter of Victoria's top football competition. Unsurprisingly, the latter showed no interest in such a contest. After all, what did the League have to gain from accepting such a challenge? It took the serious illness of Fred McGinis, a champion Melbourne Football Club player in both competitions, to bring the bitter rivals together for this benefit match in 1902. The VFL deferred to the VFA on the matter of uniforms, allowing the Association to wear their old 1890-1892 intercolonial design; the League donned the Melbourne colours in a show of respect to McGinis. Caps - through to the late-1890s it was common for players to wear caps on-field as part of their official uniform but by 1905 this practice had largely died out. Team photos of both VFA representative teams in 1905 clearly show each player wearing a royal blue cap. However, action photos from both matches confirm the caps were not worn on-field; for that reason they have not been included in the images used on this site. 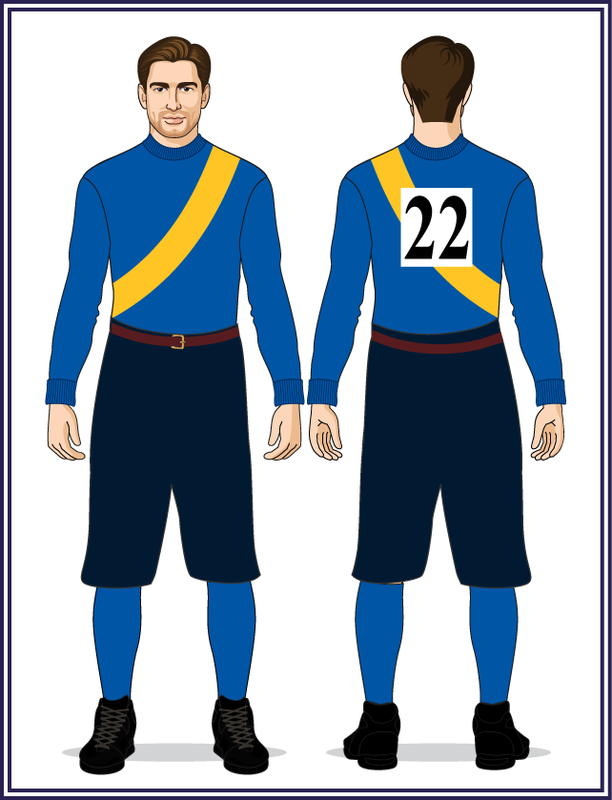 The VFA representative jumper changed to navy blue with gold hoops in 1906, making this the first Association representative team to wear navy blue since the intercolonial team of 1893. 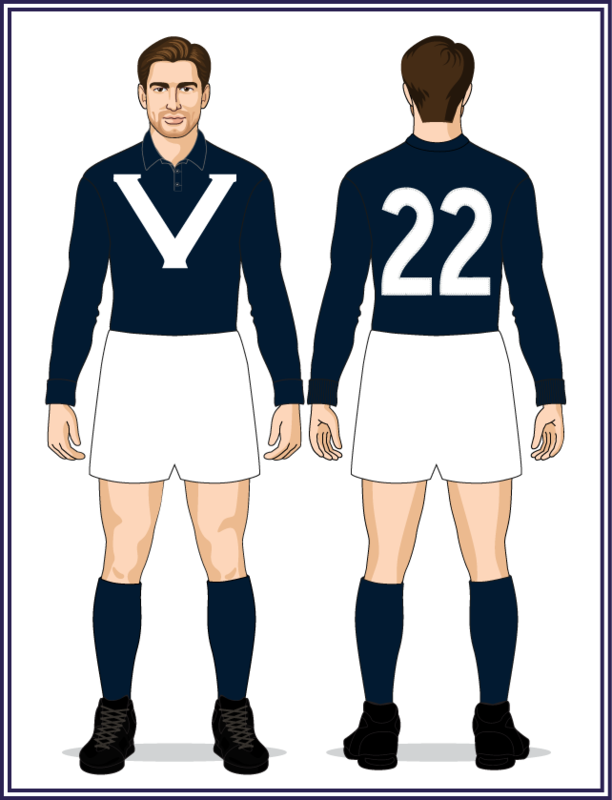 The exact reason for the change remains unknown; the VFL's representative uniform had included a navy blue jumper since 1903 and by 1906 other sports such as rowing, softball and lacrosse had also adopted the colour for any representative contests against other states. Perhaps the VFL not playing interstate matches in 1906 opened the door for the VFA's switch from royal to navy blue. As with 1905, the official team photo shows the players wearing caps but they were not worn on-field. The ceremonial nature of the caps is further highlighted by the fact they were still royal blue, despite the rest of the uniform changing to navy blue that year. After a brief flirtation with navy blue the Association returned to their 1905 uniform. The 1907 team photos again show the use of ceremonial caps that were not worn on-field, and by 1908 the caps had disappeared completely. In 1909 the VFA representative team switched to three-quarter length white knicks and added gold to their jumper cuffs and socks. This would remain the VFA's standard uniform for the next 20 years, with the exception of 1921 (see below). Season 1912 saw the introduction of jumper numbers for all VFA clubs and also for the VFA's representative uniform. Off-field, pressure from the Australasian Football Council (AFC) forced the South Australian league to cease matches against the VFA after 1911 because the Association was not a member of the AFC. The Barrier Ranges FA were also forced to follow suit in order to avoid sanctions from the AFC, ending their arrangement with the VFA after their 1912 match in Broken Hill. Due to the First World War the VFA ended their 1915 season early and went into recess during 1916-17. However, the players re-united for this one-off exhibition match between North Melbourne (1915 VFA premiers) and a combined VFA representative side comprised of players from the other Association clubs. The match was a fundraiser for former South Melbourne and North Melbourne player Harry Todd who had lost his hands in a workplace accident. Players on both sides were reported to be out of form having had no football for a year. It remains unknown what uniform the VFA team wore for this match. After an eight year absence from interstate football, in 1920 the VFA became the first top-level Victorian league or association to send a representative team to Western Australia (the VFL would send their first representative side the following year for the National Championships held in Perth). 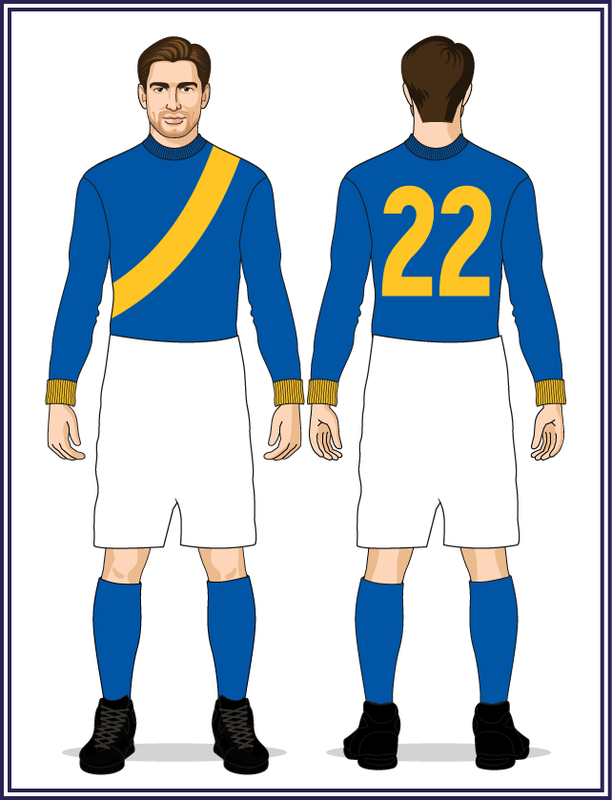 The VFA's combined side again wore their pre-war uniforms of royal blue jumpers with a gold sash. The West Australians travelled to Melbourne to meet the VFA on its home turf. The men of the goldfields, accustomed to rock-hard ovals, found themselves completely lost on the muddy East Melbourne ground and kicked just two goals in a 101-point whitewash. For this match the VFA ditched their traditional representative uniform and wore borrowed Footscray uniforms. No official reason for the switch has been found but it seems logical when one considers the similarities in the uniforms of the two sides (VFA: royal blue with a gold sash, GFA: black with a gold sash). Clearly this was not a problem in 1920 (or later in 1923) on the bone-dry surface at Kalgoorlie but on a quagmire at the EMCG such similar uniforms would have quickly become indistinguishable. A return visit to the west in 1923 saw a return to the VFA's traditional representative uniform worn since 1909. This uniform was also worn for the 1924 match against Perth, played in defiance of the AFC who did not want a WAFL club playing a non-affiliated league or club. Despite threats of heavy sanctions, the match went ahead and was played in fierce rain and strong winds. The 1926 clash against the CGFA was played in Warragul as a fundraiser for the West Gippsland hospital and the match took place a week after the VFA Grand Final. Played at the Motordrome (later renamed Olympic Park) on the Show Day holiday in front of a small crowd. This was the last time this uniform was worn, replaced by a slightly modified design when the VFA eventually returned to the representative football scene in 1931. The VFA and VFL finally brought an end to their hostilities, signing a permit agreement that cleared the way for player transfers between both competitions. After years of acrimony the League also agreed to play the Association for the first time since 1902 with the proceeds going to charity. The VFA wore a modified version of their 1909-1927 uniform, switching from a blue turtle-neck to a button-up v-neck with gold collar. 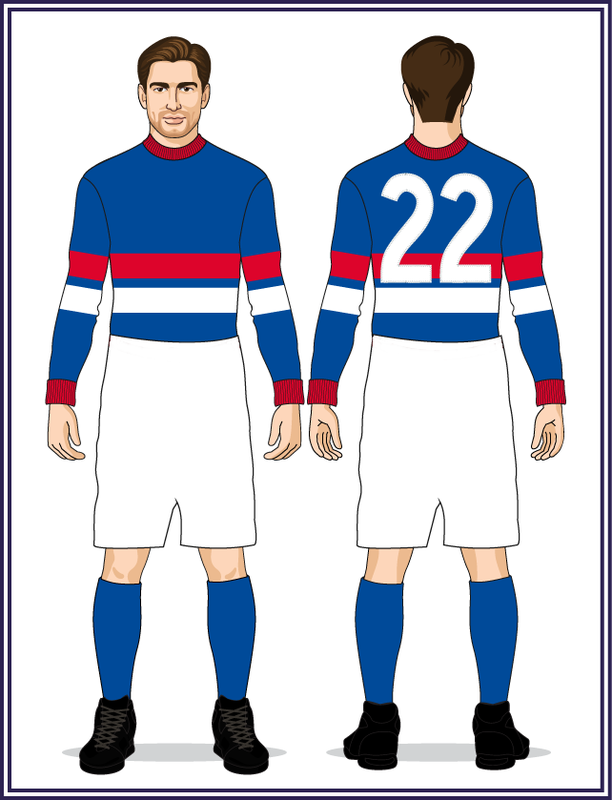 The shorts changed from the three-quarter-length knicks of the previous thirty years to the new style which had been adopted by VFA and VFL clubs during the late-1920s. A unique, "swirled" number font was also introduced for this match but was soon replaced by the traditional footy font. The VFL had been playing regular interstate matches against New South Wales since 1920 but were unable to send a team to Sydney in 1931. The NSW league approached the VFA to take the VFL's place but this required ANFC approval because the VFA was not an affiliated competition. 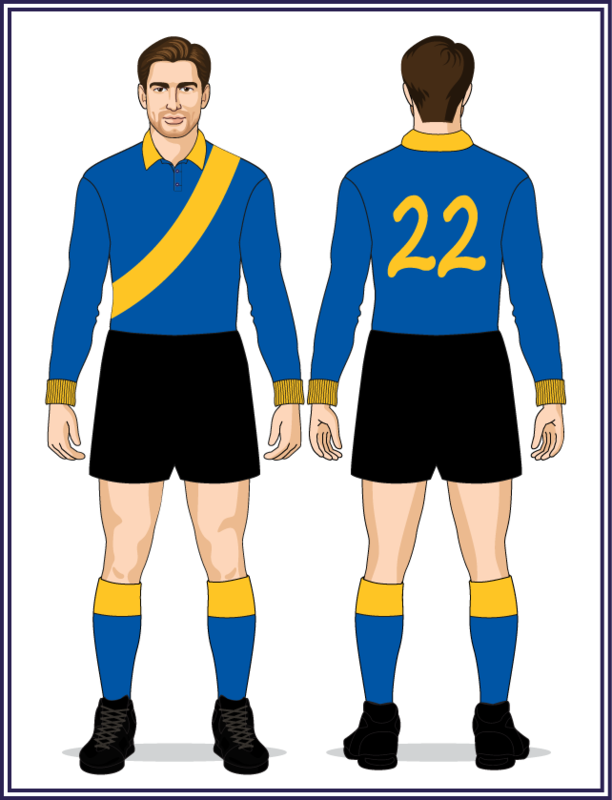 For this match the VFA broke with tradition, ditching their gold sash which had been part of their representative uniform since 1890, and replacing it with a blue and gold version of the uniform worn by the VFL in their match against the VFA two months earlier (see the image above right). In the King's Birthday holiday the VFA confronted the VFL at Princes Park and were unlucky to lose a hard-fought match by 8 points. This match marked the only occasion in interstate/representative football when both teams wore matching designs, with their respective colours the only variation between the two sides. 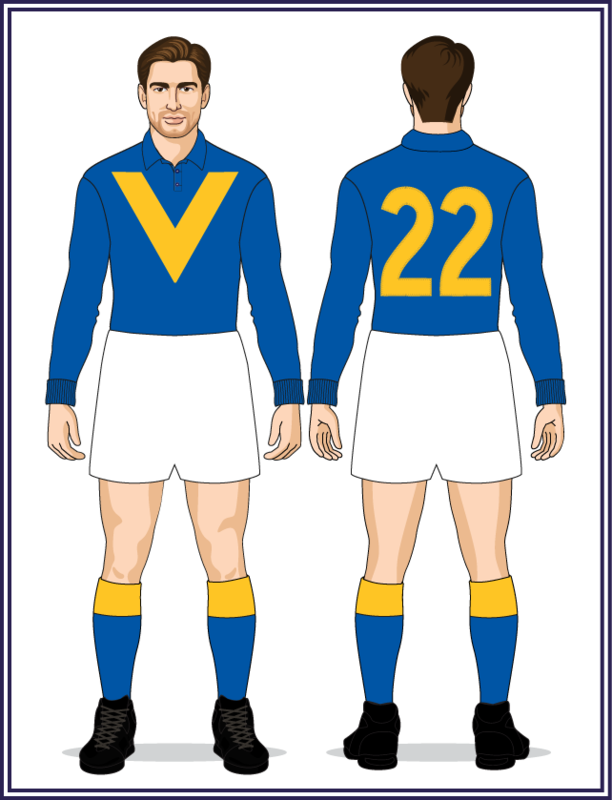 The VFA's royal blue and gold uniform is shown at left, with the VFL uniform shown at right. 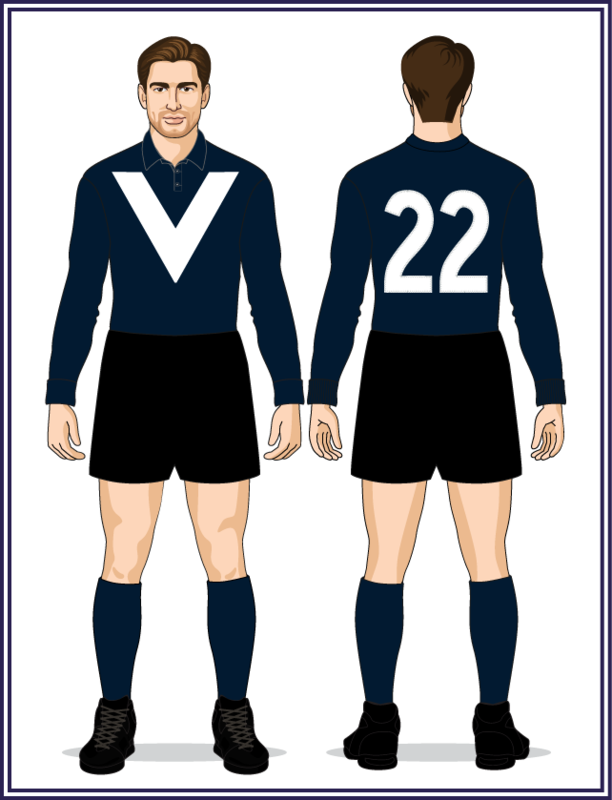 Black shorts - since 1909 the VFA's official uniform had included white shorts, but in 1931 the Association made an exception and wore black for their historic clash against the VFL. However, for this match In 1932 they requested the League switch to coloured shorts and the VFL reluctantly agreed. By the time these teams met again in 1934 the VFL had returned to white shorts for all matches, regardless of the opponent, forcing the VFA to wear their non-traditional black shorts in future contests between the two competitions. After two seasons of copying the VFL's uniforms, the VFA finally established their own identity with this unique design featuring a VFA monogram on the front. Unfortunately, this instant classic has remained largely forgotten... until now. An exhibition match held to increase regional interest in the VFA, and played on a Monday public holiday. Four VFA players took the field for the opposition: Egan and Brokenshire (Sandringham), Jack Blackman (Preston captain-coach) and Laurie Taylor (Camberwell). Egan was the BFA's best player and Brokenshire kicked 10 goals for the locals. To date, it remains unknown what uniforms the VFA representative team wore for this match.